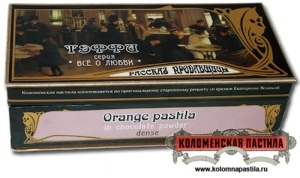 If chocolate-coated ‘Teffi’ bonbons tasted nearly as good as Nadezdha Alexandrovna Lokhvitskaya’s own prolifically produced literary confections, they must have tasted perfectly delicious: light on the palate and yet a rich mouthful; intriguingly exotic textures and aftertastes enveloping an unadulterated kernel of pure truth. ‘Teffi’ perfume would have been equally alluring, causing men to melt and swoon with either passion or laughter – or perhaps intriguingly, irresistibly, with both. 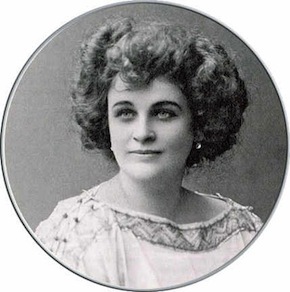 Teffi was born (so legend has it) in 1872, to a family of aristocratic lineage and bohemian inclinations and pursuits. Her father was a lawyer and a scholar, a prominent public figure in St Petersburg – Moscow’s haughty, better half; her mother was of French descent, a lover of poetry and European literature; her great-grandfather was a mystical poet, and her sister Mirra one of the most celebrated poets of her time, dubbed the Russian Sappho for the beauty and daring of her verses. Twice a Pushkin Prize recipient, a muse for Akhmatova and Tsvetaeva, Mirra Lokhvitskaya died young, desperately in love with the Byronic polyglot poet and translator Konstantin Balmont, who swept the whole of Russia irreverently off her feet: the same Balmont evoked fervently and cryptically at the end of Teffi’s own Memories. An imperious enchantress in her photographs, with arched, bushy eyebrows (which were later fashionably plucked along more minimalist lines), a determined lower lip and eyes of oriental aloofness and seduction, Teffi grew up surrounded by books – it would be fair to say that she grew inside their pages as much as she did inside her house or across the streets of her home town. At thirteen, and about to visit Leo Tolstoy, she determined that she would ask him to revise War and Peace, so that Prince Andrei would not die (and, we are to infer, marry Teffi instead). The request in the end was not made, but the will of the thirteen-year-old to mightily oppose the irreversibility of fate would grow into indomitable zest in the mature woman. Teffi would abandon her husband and her three children and throw herself hell for leather on a career as a writer. Initially a liberal, praising the new forces of revolution and radical change, Teffi found herself, like Nicholas Berdyaev and so many others, quickly and starkly disillusioned by the Bolsheviks, whom she called “a Satanic vinaigrette”, to a fast wilting salade russe. Ferociously bitter-comic juxtapositions between the normal and the anomalous, a motley array of unconventional fellow travellers, alternating images of horror and high comedy make Memories both an irresistible read and a staggering chronicle of events, experiences, traumas and reflections. Shock is part of this journey through flickering light and growing darkness, as in the scene where Teffi is told not to look at what she has almost not seen: a dog trotting off dragging an arm it has gnawed off a corpse. Next comes “steaming hot tea” against migraine, and “a house [that] was the picture of peace”. The events of the second third of the twentieth century would eclipse this other world-changing, life-blasting, horror-raising trauma, the moment of the Russian Revolution. Teffi’s humour allows her to lampoon and denounce the Bolsheviks’ objectification of the individual and their catastrophic effect on language and common sense, as well as the privileged naiveté of the upper classes – at one point a lady asserts that Maxim Gorky “must have known he’d become a writer, why else would he have gone to work in a bakery”, if not to collect hands-on ambiance experience? Free of either cynical resentment or resignation, Memories is an acceptance of life, suffused with an infectious spirit of joie de vivre. Real characters like Mishka the Japanese, a “piratical Alexey Tolstoy”, or the clairvoyant Armand Duclos, coexist in grinning harmony with the fictitious Gooskin or his interminably cooking mother. There are staggering moments of pure tragedy and sadness, which Teffi manages to conjure up with what can only be called the petrifying eloquence of silence. Her humour comes from the contrast between crisis and chaos, and a blind adherence to grotesquely warped, ghostly gestures of normality. As we come across the Russian Tweedledee and Tweedledum, we know we have reached a forced exile’s no-man’s land. One of the final train journeys described in the book will probably remain indelible in the memory of anyone who reads this book: it is “about those who are no more”, victims and perpetrators alike, ghastly apparitions of horrific reality and even more terrifying delusions. In scenes like this, Teffi allows a glimpse of a different, harder metal underneath: the dehumanising violence of the revolution, the ruthlessness on both sides, the ravaged, wasted fates of those who fled and those who stayed. A church through the fog is “hushed to the point of mystery”, as Teffi and those who could follow her path sever tie after tie with all semblance of life as they knew it. Teffi’s comic pathos and bathos conceals unmitigated pain and wounds that will perhaps not heal, her Ionesco-like dialogues and the oblique, close-cropped sketches of life speak a deeper darkness but also allow for some ultimate, elemental survival. Sometimes the gilding chips, flakes and falls from the shimmering narrative of this laughter of tears: peasants are invariably coarse and become brutish with their revolutionary conversion; Jews are quaintly grotesque or profiteering money sharks; the French North Africa corps sent to resist the Bolsheviks are Negroes with cannibal-like teeth and a gibberish tongue. The fleeing upper classes are also exposed to mordant, P.G. Woodhouse wit, and it is sometimes hard to distinguish the mask from Teffi’s real face. Yet these are hairline cracks on a vastly impressive mural of the human whirlwind and the fragile humanity that was the epos of Russian émigrés. Tense contradictions strike at the heart of the Russian soul, and this is writing and existing on the cutting edge of dichotomies and paradoxes that ultimately unify Russia under its single, heterogeneous identity. Like the art movements that marked Russian aesthetics between 1870 and 1925, Teffi’s account is as much naturalistic as it is impressionistic, artfully folkloric, slavophile and Western-born. In contrast to the celebrated Wanderers, like Repin, Serov, Levitan or Nesterov, who sought to paint the heart and breath of Russian life, Teffi draws the stark, angular lines of mass exodus, of the brutal collapse of a world order, an entire history, spiritual outlook and cultural universe. 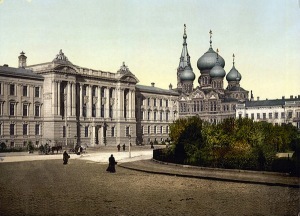 Even as she draws the distinction between Russian and Western prose and narrative perspectives – “a Russian is surrounded by enormous, broad and lasting things, the steppes, the sky. In the West, everything is crumpled and enclosed and this automatically produces a turning towards the self, inwards” – Teffi succeeds in bringing the two together: the immensity that must be abandoned with the new urgency for self-examination. The subtly expressive poise of Natalia Goncharova or Nathan Altman is no longer possible, nor Pushkin’s pensive bite. One could say that Teffi borrows her colours from Mayakovski and Chagal, her shadows from Bulgakov and her ironic panache from Malevich, producing tableaux of extraordinary brilliance, startling abstraction and exhilarating style – the style of displacement, disbelief, dispossession but also exuberant avant-gardist disobedience to what appears to be an inescapable, inalterable fate. Teffi reached Paris after Constantinople, where she wrote until the end of her life in 1952, injecting her effervescence and resilience into the Real Russian Club, the Green Lamp, and many more cultural homes of refugeedom. Her vitality helped her hide the scars and the sadness, transcend loss and perhaps the enigma of her relationship to motherhood. Teffi (Nadezhda Alexandrovna Lokhvitskaya) was a phenomenally popular writer in pre-revolutionary Russia – a favourite of both Nicholas II and Lenin. In her lifetime she published countless stories, plays and feuilletons. 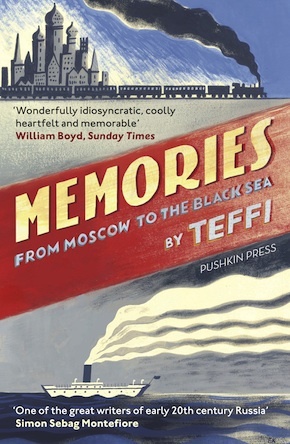 Memories is published by Pushkin Press, translated by Robert and Elizabeth Chandler, Anne Marie Jackson and Irina Steinberg, and was shortlisted for the 2017 Pushkin House Russian Book Prize, picking up a special prize for the best Russian book in translation.